In celebration of National Take Your Dog to Work Day on June 23, Purina today launched the first Pets at Work Report, examining pet owners and their attitudes around having pets in the workplace, and the benefits it brings to employers and employees. "Pets bring a wealth of benefits – both physical and emotional – to pet owners and their families, so it's no surprise those same benefits also apply to the workplace and employees," said Dr. Kurt Venator, DVM, PhD, and Purina's Chief Veterinary Officer. "Whether a pet helps provide a calming sense during a challenging situation or encourages employees to take a walk during their lunch break, here at Purina, we experience the benefits of pets at work every day and want others to as well." "Based on the findings in the report, three in five of those surveyed who wish their workplace had a pet-friendly policy said they would spearhead efforts to make it happen," Venator said. "With that said, our hope is that the annual report will continue to raise awareness and arm employees and employers with insight that can help facilitate pet-friendly environments within their companies." Pets at Work is an ongoing movement that remains an important initiative for Purina and was demonstrated last year when Purina and several pet-friendly companies collaborated to break the existing record of most pets in the workplace in one day: 691 dogs and cats. To help other employers who are considering starting their own Pets at Work program, Purina has created a digital toolkit with tips and tools such as office checklists, signage and authorization forms. The free toolkit is available for download at www.purina.com. 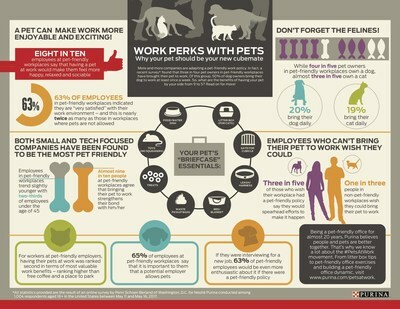 To learn more about Purina's efforts to celebrate pets in the workplace, visit www.purina.com/petsatwork. Penn Schoen Berland (PSB), an independent research company, conducted the poll on behalf of Purina, distributing 1,004 total online interviews among U.S. general population respondents who are currently employed, including those who work in a Pet-Friendly workplace, between May 11-16, 2017.